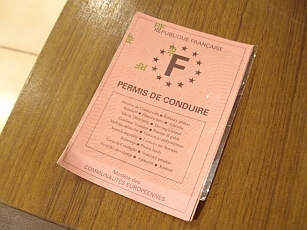 Yesterday afternoon CC and I were invited to our neighbour’s to “arroser son permis” – literally “to water her driving licence”. Since her husband died, nearly two yars ago, she has felt rather stranded without transport and at the age of 54, started driving lessons. The first hurdle was the ‘code’ as you have to pass the theory before you are allowed behind the wheel and it took her three attempts to achieve the passmark of 36 out of 50. A rota of neighbours, including Jay, drove her into town three or four times a week to sweat over the computers at the driving school doing practice tests so she wasn’t the only one to be disappointed at each failure. It was quite a commitment giving her lifts for well over six months. Finally she passed and began driving. It didn’t seem long before she took her driving test and I was surprised to find out that the instructor sits in the back of the car but mustn’t say anything and at the end, the examiner doesn’t tell you whether or not you’ve passed. This is because it has been known for fists to fly in the event of a failure! Claudine had already bought herself a secondhand car and it was sitting in her garage so she was really disappointed to learn that she had failed – especially since her instructor had led her to believe that she had performed well enough to pass. However, a few weeks later the chap who had examined her made the front page of the local paper becasue he was notorious for failing everyone. He had been sent off for ‘retraining’ but was just as reluctant to pass anyone on his return. You’d think they would have given her a free repeat test, but no, she had to pay again. The new test was scheduled for 8a.m. one morning during the snowy weather. Needless to say it was cancelled and she had to wait several weeks before getting another slot and safer road conditions. But just over a week ago SHE PASSED!! Of course, that was a good reason to get out the champagne and invite friends and neighbours round. She provided apple tart, custard flan and gateau au sucre (a local speciality) and we got through a couple of bottles of fizz before she sobered us up with coffee. Fortunately no-one had to drive home as the flics round here are horribly hard on anyone caught driving under the influence. In France you lose points for traffic offences and a new driver only has 6 points for the first year, in contrast to the usual 12. Last night I watched a programme about some people’s unwillingness to accept scientific ‘facts’ any more. There was a great deal about global warming (which has actually become ‘Climate Change’) and the presenter put forward the arguments opposed to the many who dispute the idea that global warming – if in fact this is happening – is caused by man. But I was mainly looking forward to hearing what he had to say about GMOs and was disappointed when he only dealt with one small experiment in fields around Norwich where scientists from the UEA were trying to grow blight resistant potatoes: surely, according to him, a very worthwhile, useful and harmless project. But he made no reference to the activities of Monsanto who, in my humble opinion, are doing untold harm to the environment. Isn’t it logical to wonder if producing weed resistant plants will lead to even bigger and more resistant weeds? Nature always seems to come up with a response and no amount of scientific experiment can predict what that might be. Making seeds which will not reproduce is a dangerous ploy. It seems they want to hold the monopoly on seed supply – a very dangerous situation. (NaturalNews) It’s one of the most common false arguments of GMO pushers: There’s nothing to be worried about with genetically modified foods, they argue, because almost everything is genetically modified, they claim. What they’re referring to is the genetic selection used in the long, slow development of many crops such as wheat, which originally began as a grass but was shaped generation after generation through the selection of larger seeds, ultimately leading to modern-day wheat. GMO poison pushers attempt to confuse people with these terms by claiming that “lots of foods are genetically modified,” thereby blurring the distinction between genetic selection versus genetic engineering. I’ve even heard top-level scientists attempt to use this false argument, hoping that no one will notice. The simple truth is that genetic selection works in harmony with natural processes of gene variation within a species. If you grow corn, and you save the seeds from your best-tasting corn to plant the next generation of corn, you are engaged in genetic selection. This is natural. But the GMO industry doesn’t even want you to be able to save your seeds from one generation to the next. They use “terminator” technology in the seeds to ensure that the second generation of seeds is non-viable. That alone is a crime against humanity because it forces a seed monopoly upon farmers and consumers in developing nations and first-world nations. This is why any individual or organization that is in favor of seed-termination technology in GMOs is supporting a crime against nature. As usual, the powerful corporations pushing GMOs are attempting to blatantly confuse consumers (and journalists) over the difference between genetic selection versus genetic engineering. None of the biotech GMOs are created through selection processes along. They all are based on artificial genetic engineering. • GMOs are created through artificial genetic engineering of plant DNA, usually through inserting animal genes into plants. • Genetic “selection,” in contrast, is a natural process whereby people plant seeds, generation after generation, from their crops that demonstrate desirable characteristics. This is how wheat, corn and other crops were developed over centuries of seed selection. • The GMO industry uses seed terminator technology to forbid seed saving and planting, thereby forcing farmers to buy seeds year after year (creating a seed monopoly and a single point of control for food). • People who promote GMOs are engaged in crimes against humanity and crimes against nature. They promote dangerous technologies that threaten the future of life on earth by causing genetic pollution and a sharp loss of seed diversity. • GMOs have been linked to at least 200,000 suicides in India over the past decade due to failed crops (http://www.naturalnews.com/030913_M…). • The GMO industry has financially taken over much of the mainstream media, politicians and science journals (http://www.naturalnews.com/031093_u…). They will not stop until they achieve complete control over the world food supply, enslaving humanity in a food monopoly. • GMOs cause “genetic pollution” that damage other crops and ultimately threaten the reproductive viability of crops in the long term. The future of food is jeopardized by GMOs. • The GMO industry is now attempting to brand all opponents of GMOs as “unscientific” by claiming that GMO = science, and therefore anyone who opposes GMOs is automatically an opponent of science (http://www.naturalnews.com/031093_u…). • The GMO push into Europe is a confirmed conspiracy involving U.S. officials and GMO corporations, as revealed in a Wikileaks cable that the mainstream media has still refused to report (http://www.naturalnews.com/030828_G…). • The next great food famine (and mass starvation) will undoubtedly be caused by GMOs. And yet the industry claims that GMOs will save the planet from starvation! Only in a crooked, corrupt world could an industry claim to be saving the world while actually enslaving the world. Visit www.NaturalNews.com/NoGMO to learn more. It was a big disadvantage, as a teacher, that I always had difficulty putting names to faces. A typical example: _ during the first week of term a child comes to me during break to ask about music lessons. I give him a brief explanation and then, to find out if I teach his class for music I ask whose class he is in. To help with this ‘disability’ I used to enlist the help of the children. We would play the game of “How many names can teacher remember?” They would keep a record of the scores and so I was motivated to improve. When I did get better they would change places to make the test harder. After about three weeks I usually managed to learn to recognise all the children in my own class but have to admit that sometimes I never really got to know everyone in the classes I taught only once a week. This could prove to be most embarrassing when it came to parents evenings and report writing. In view of all this you can imagine my delight when term started for my Monday English classes this week and I found that – at last – I knew almost everyone so didn’t have to keep referring to my seating plans. Problem is, I’m not sure I’d recognise them if I met them in the street. . . . .
Just found this video which gives an amusing twist to the not so funny attempts to pollute our food with pesticides and irradiation while, at the same time, if reports from America are to be believed, making life extremely difficult for producers of organic foods. Are we in danger of losing our free choice in matters of nutrition and alternative therapies? Grocery Store Wars -Organic Farming, Factory Farming, GMO (2005) – NaturalNews.tv. Ever since the end of the festivities time has become very confusing for me. Normally it flies by and the weeks come and go in quick succession. Recently time has passed more slowly and I keep thinking it’s a day ahead of the actual date. Maybe it’s because I’ve been too laid back and got into the habit of taking things easy. After all, CC seems to have made a New Year’s Resolution to get up early and look after Whale while I feed the cats and chickens and do other chores so that gives me more freedom in the mornings. Is that why time drags? Of course, I shouldn’t complain. I’ll leave that to Bear, who informed me that I’m being terribly selfish for teaching on Mondays and Tuesday evenings (for ONE hour) plus going to Italian class on Wednesday when I should be at home talking to him. I did sit in the armchair next to him after we’d cleared away after lunch but he kept his nose in a book. I got up to collect the eggs and when I came back he was watching a repeat of a traffic cops programme that he must have seem umpteen times before. Men!!!!!! There is custom here whereby people call to share New Year wishes and so it pays to have drinks and nibbles at the ready. Some friends even have a custom of bringing a log (giftwrapped!) on their first visit of the new year but opinion is divided as to whether you should burn it or keep it to bring good luck. CC has taken down the decorations and stripped the tree for Jay to lug outside. It was well worth paying a bit extra for a tree that didn’t shed too many needles. It made the clearing up so much easier and we didn’t block the vacuum cleaner like we did last year. The village provides a helpful service of collecting Christmas trees from outside your house – and they also collect garden rubbish every Monday during the Spring, Summer and Autumn. Our tree may have to sit there for a week or so though as most French people keep their decorations going for much longer. We have seen Father Christmasses clinging to drainpipes in March – perhaps forgotten or inaccessible? Here’s my latest ‘project’. 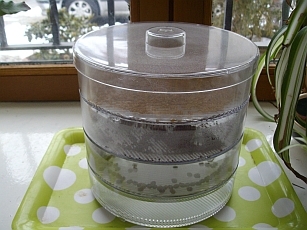 While clearing out a cupboard I found a beansprouter and some seeds still well within date. After all the recent excesses we can do with some fresh, raw food. Wonder if Bear and Whale will eat any. . . . . .